The “chest/breast” area is on the sides of the tongue, between the centre part and the tip. The chest area reflects a pathology of three organs: heart or lungs in men and women or breast in women. Examples of lung pathology manifesting in the chest area are chronic asthma or chronic emphysema (in which case the chest area would be swollen and possibly purple). An example of heart pathology is chronic coronary heart disease (in which case the chest area would be purple). As the area on the sides between the centre and the tip reflects the condition of heart/ lungs/ breast, I call this the “chest area”. In women, a purple colour in the breast area indicates Blood stasis in the breast. Blood stasis in the breast may cause masses such as fibroadenoma or carcinoma. Although we should never assume that a purple colour in the breast area indicates carcinoma of the breast, we should always take it seriously and treat it by invigorating Blood in the breast. In case of carcinoma of the breast, there is a correlation between the purple colour of the breast area and the prognosis: the darker this area, the worse the prognosis. 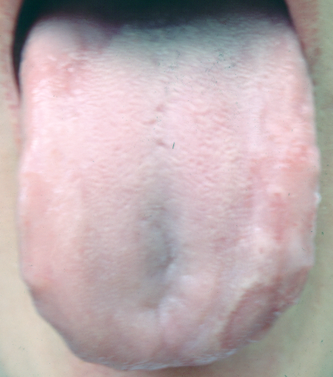 If the breast area on the tongue is purple in women who have not been diagnosed with breast cancer, this sign may indicate a tendency towards the disease before any symptoms manifest; for this reason, observation of the chest/breast area in women is particularly relevant. When I do tongue diagnosis in a woman, I always check the chest/breast area carefully. Apart from a purple colour, other possible changes in the chest area are teeth marks that are confined only to the chest area, red points, the absence of coating in the chest area and a swelling. In women, teeth marks only in the chest area indicate usually a problem in the breast (possible carcinoma) occurring against a background of severe Qi deficiency. Red points in the chest area indicate Toxic Heat in the lungs or breast. In women, an absence of coating in the chest/breast area indicates a possible problem in the breast occurring against a background of Yin deficiency. In women, a swelling in the breast area indicates Phlegm in the breast (which may cause fibrocystic disease or also contribute to the development of carcinoma of the breast).